High-resolution frequency domain optical coherence tomography (OCT) stands out amongst a range of novel dermatologic imaging technologies, with its good detection sensitivity around -100 dB, high measurement speeds allowing real-time image acquisition and its ability to acquire high definition crosssectional and 3D tomograms of regions greater than 1 cm2, providing tissue information comparable to conventional histopathology without the need for any contrast agents. Typical axial and transverse resolutions of state-of-the-art OCT systems range between 1–10 μm and approximately 20 μm, respectively, depending on the employed wavelength region. This review investigates the significant progress accomplished in the field of dermatologic OCT with respect to other in vivo diagnostic methods for preexcisional imaging of nonmelanoma skin cancers and specifically emphasizes state-of-the-art results achieved in different clinical pilot studies. Further technological extensions of OCT, various multimodal imaging approaches as well as potential clinical dermatologic applications are discussed. Imaging in dermatology is traditionally limited to simple visual examination due to the easy accessibility of the tissue. During the past three decades, new imaging techniques that improve the diagnostic accuracy of various skin pathologies have been developed. The implementation of dermatoscopy facilitated new possibilities for the diagnosis of pigmented skin lesions by visualizing small or weakly contrasted morphologic features, often imperceptible to the unarmed eye . However, successful interpretation of these lesions highly depends upon the skills of the examiners and their clinical experience . To achieve an accurate diagnosis, skin biopsies and subsequent histopathological examination are needed in the majority of cases. To date, this is considered as the gold standard for morphological investigation of the skin. Despite the invasiveness of biopsy, histological processing also introduces several disadvantages: in addition to the artifacts occurring during the surgical intervention and sample processing, the preparation of the probe is time consuming and expensive. Moreover, it only represents a temporal and spatial snapshot during the course of a disease and does not allow for repetitive measurements. Typically, it covers only a very limited number of cross-sections, while being destructive for the surrounding tissue. Hence, there is a strong demand for noninvasive, high-resolution, in vivo imaging techniques, such as confocal microscopy (CM), multiphoton tomography (MPT) and optical coherence tomography (OCT). Apart from the diagnostic advantages, such as surgical planning assistance, in vivo methods also allow for new insights into dynamic processes such as topical treatment monitoring, where histopathological examinations are of very limited use. In recent decades, a number of different optical and nonoptical imaging devices have been developed [3–8] that are capable of either screening large areas, or enlarging and contrasting minute details at cellular or subcellular resolution. Among the nonoptical techniques, high frequency ultrasound with acoustic spectral bandwidths above the commonly implemented frequencies around 20 MHz was evaluated for cancer diagnostic purposes . However, clear delineation of tumor borders was complicated and not extremely successful, leading to a high remittance rate . More demanding 75 MHz high frequency ultrasound  was demonstrated ex vivo, but clinical applicability and usefulness remains questionable due to its lower spatial resolutions compared with other competing skin imaging technologies, and owing to the different contrast mechanism that emphasizes the elastic properties of tissue. Micro magnetic resonance imaging (μMRI), which has increased resolution with respect to full body scanners, is an expensive method with good underlying tissue contrast and no penetration problems. However, μMRI resolution is in the 80 μm range at best [12,13], and therefore approximately two orders of magnitude worse than histology. This limits the utility of μMRI in cellular-level investigation of tissue, which is required for early detection of cancer and for differentiation between diseases. 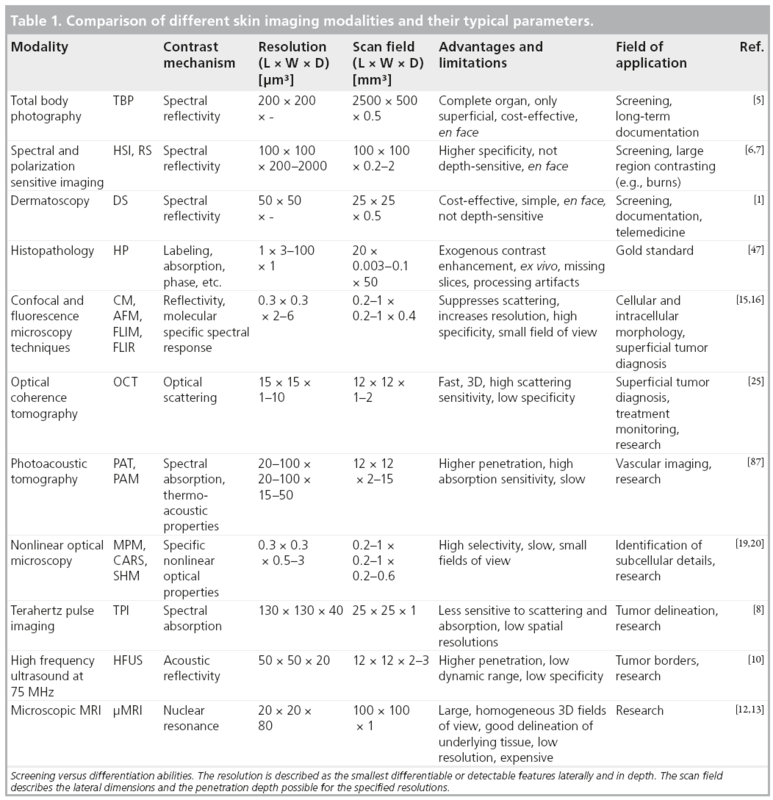 Table 1 compares the contrast mechanisms, resolution limits, penetration depth, advantages and limitations of different skin imaging modalities. Optical imaging technologies operate at high frequency regions of the electromagnetic spectrum (~200–750 THz), but more frequently in the deeper penetrating infrared than the highly contrasting visible region. However, the latter is the normal approach during visual examination, whole body photography  and dermatoscopy, which is a natural extension with additional digital documentation capabilities. On top of these, more microscopy-orientated techniques have been developed with features that partially overcome standard histopathology and can be applied in vivo. CM is one of the most prominent noninvasive in vivo biomedical imaging modalities that can perform optical sectioning of human skin in the horizontal plane with a resolution comparable to that of histology. Its depth sectioning capability and reflection or fluorescence sensitivity can be utilized for cancer diagnosis in thin (~200–300 μm) samples [14–16]. CM systems offering cellular resolution have been successfully employed in several clinical investigations to identify nonmelanoma skin lesions and to monitor treatment responses in vivo . However, the potential cellular and subcellular level resolution in lateral direction is accompanied by penetration and axial resolution limitations for optical imaging techniques (Figure 1). Techniques such as MPT improve resolution, but still limit penetration in the axial direction to typically approximately 200 μm in human skin [18–21]. MPT enables 4D functional imaging of subcellular structures by detecting second harmonic signals, autofluorescence and spatially resolved fluorescent decay kinetics. This technique enables visualization of en face sections at the dermal–epidermal (D–E) border at approximately 70 μm depth in normal thin skin, with good endogenous contrast and lower exposure than CM . Despite their excellent resolution and contrast, which is helpful for in vivo identification of superficial tumor material, these methods are primarily imaging parallel to the skin surface. Hence, they lack layer information and are performed at limited speeds (multiple seconds per frame) within small fields of view, typically approximately 0.5 × 0.5 mm2. Thus, these techniques can only be used for sampling subregions of tumor lesions, which can be multiple mm2 to cm2 large in advanced stages. This limits the practical utilization of these imaging modalities for tumor border delineation. Besides fixation issues during scanning, the longer acquisition times are a limiting factor for clinical applications at inaccessible, curved or sensitive body locations, such as the face. By contrast, OCT utilizes an interferometric coherence gating principle of spectrally broadband radiation (typically tens to hundredths of nanometer bandwidth) for depth ranging, rather than using tightly focused beams that necessitate complex and bulky optics to reconstruct 3D images of tissues. This technique offers penetration in the range of 1 to 2 mm to enable visualization of clinically significant cutaneous layers, such as epidermis (EP), D–E junction, dermis and even subcutis, depending on the employed wavelength region with the capability of real-time in vivo imaging (100 Mvoxel/s and above) [22–24]. Figure 1: Prominent skin imaging modalities. The scale bars denote 200 μm. CM: Confocal microscopy; DS: Dermatoscopy; HFUS: High frequency ultrasound; MPT: Multiphoton tomography; μMRI: Micro MRI; OCT: Optical coherence tomography. Adapted from [12,20]. The principle of OCT is similar to that of ultrasound imaging, using a time of flight measure for determining the penetration depth of optical signals in biological tissues at different transverse positions to reconstruct a cross-sectional image, termed as a B-scan (intensity tomograms with a depth and a lateral axis) . OCT is highly sensitive to biological reflectors or scatterers, due to the localized variations in refractive index at the optical interfaces formed by the membranous cavities or the extracellular matrix. The principle of OCT is based on low coherence interferometry, which amplifies the backscattered light that is detected with high sensitivity and large dynamic range, measuring signals in the range of 60 to 110 dB of the incident light intensity . The axial resolution of an OCT system is determined by the coherence length of the light source, which is the optical path difference within which interference occurs, and it is inversely proportional to the spectral bandwidth of the light source. Unlike optical microscopy, the transverse resolution of an OCT system is decoupled from its axial resolution due to the coherence gating and is determined by the diffraction-limited spot size of the focused optical beam. The interferometric detection of the backscattered signal can be performed either in time or frequency domain. In time domain OCT, the sample reflectivity profile along depth is directly detected using a scanning reference mirror . Whereas, in frequency domain OCT (FD-OCT) detection the entire interference spectrum is measured to reconstruct the sample depth information through inverse Fourier transformation. FD-OCT offers significantly increased efficacy resulting in considerably improved detection sensitivity and image acquisition speed, as all the echoes of light in depth are measured simultaneously [26,28–31]. Although 1D optical interferometry was demonstrated in the mid-1980s, OCT B-scans were accomplished for the first time in 1991 and the first in vivo studies of the human retina were performed in 1993 [32–36]. In the past two decades, the development of ultra-broadband light sources, advances in fiber optics and introduction of frequency domain techniques have led to significant improvements in resolution, detection sensitivity and image acquisition speed [37–43]. OCT gains its structural contrast from the refractive index variations within the sample. In the near-infrared wavelength region (700–1700 nm), scattering is the predominant mechanism limiting light penetration into tissues. Scattering within biological tissue is inversely proportional to the center wavelength of the light source. Thus, light penetration depth can be increased by employing longer wavelengths in OCT systems. However, imaging at longer wavelengths for deeper penetration affects resolution. As both axial and transverse resolution scales with wavelength, even broader light sources would be needed at longer wavelengths. Most OCT systems operate in the wavelength region of 700–1300 nm, known as the ‘optical diagnostic window’, where light absorption by tissue components, such as water, melanin and hemoglobin, is relatively low. Since water constitutes more than 90% in dermal tissues, water absorption becomes a major problem for wavelengths greater than 1300 nm. Hence, the majority of OCT systems used for dermal studies employ 1300 nm wavelength region. The capability of OCT to perform ‘optical biopsy’ (i.e., the nonexcisional in situ, real-time visualization of tissue morphology with a performance comparable to the gold standard of excisional biopsy and successive histopathology) makes it a promising noninvasive imaging modality for the visualization and interpretation of cutaneous anatomy. To date, OCT has had the largest clinical impact in ophthalmology due to its simple optical access, unmatched resolution and sensitivity for retinal imaging. In most biological tissues, including the skin, the major limiting factor of OCT is its reduced penetration depth due to strong scattering and absorption of light. However, the imaging depth of around 1–2 mm covers the clinically significant portion of the EP and the dermis in the normal skin, while biopsies of pathologies typically include subcutaneous fat over multiple millimeters. Many diagnostically important changes, such as those associated with malignant conditions and various cutaneous diseases, occur first in the superficial epithelial tissues before they grow into deeper regions. Since the introduction of OCT into dermatology in 1997, OCT has been utilized to obtain qualitative and functional information from the human skin in vivo [22,24]. In addition to the visualization of micromorphological details of the normal skin, several investigations have been conducted to examine inflammatory skin diseases, such as contact dermatitis and psoriasis . OCT has been evolving as a promising diagnostic tool for the detection of tumors, such as malignant melanoma and basal cell carcinoma (BCC) [45–49]. However, more clinical trials have yet to be pursued to determine the capability of OCT in identifying malignant skin lesions and delineating tumor margins. Other promising applications of dermatologic OCT are the monitoring of topical treatments in vivo, observation of the wound healing process, monitoring mechanical interactions of devices, such as microneedles in situ, evaluation of the effects of UV radiation and epidermal thickness measurements [50–53]. Many OCT systems designed for clinical dermatological applications are commercially available in the market. Thorlabs (Newton, NJ, USA) has played an important role in translating OCT systems from research laboratories to clinics. They designed several spectral domains and swept source OCT systems intended for skin imaging applications. Their swept source OCT system (OCS1300SS) centered at 1325 nm with a depth-scan acquisition rate of 16 kHz has been available since 2005. They also released three different versions of spectral domain OCT systems centered at 930 nm with depth-scan rates varying from 1.2 to 110 kHz. The market price of these OCT systems range from US$27,000 to 70,000. Michelson diagnostics Ltd. (Orpington, Kent, UK) made a significant progress in the clinical impact of dermatologic OCT by designing a multibeam swept source OCT system (VivoSight) centered at the 1300 nm wavelength region with an imaging speed of 10 kHz. Their multibeam approach significantly improves the lateral resolution over the entire scanning depth, thereby providing higher image quality . These dermal OCT systems have received US FDA approval for clinical applications. VivoSight OCT systems are being used for screening and monitoring nonmelanoma skin cancers (NMSC) patients by dermatologists in the USA . The commercial market of dermatologic OCT systems is rapidly expanding with more companies such as Santec corporation (Komaki, Aichi, Japan) offering high performance OCT systems with either real-time 2D or 3D imaging capabilities. The demand for dermal OCT systems has been on the rise, since the utility of OCT in various dermatological applications, such as delineation of tumor margins, noninvasive monitoring of treatment progress and reducing the number of stages during Mohs micrographic surgery has been demonstrated . However, most of the current commercially available OCT systems are limited to cross-sectional imaging. Most of the OCT images displayed in this review were obtained using a custom-designed dual wavelength 800/1300 nm OCT system. As shown in Figure 2, the dual wavelength OCT system consisted of two spectrometer-based FD-OCT systems centered at the two wavelengths operating at high speed, resolution and sensitivity to obtain high-quality images of various dermal structures. The 800 nm FD-OCT system used a spectrometer configuration based on a transmissive grating and an ultra-broadband Ti:Sapphire laser (Femtolasers GmbH, Vienna, Austria) with a center wavelength of 800 nm and a full width at half maximum (FWHM) bandwidth of 180 nm. The axial resolution of this system was approximately 3 μm. The interference spectrum returning from the beam splitter was collimated using a 30 mm wide collimator onto a 50 × 50 mm transmissive grating with 1200 lines/mm. The grating dispersed the incident beam onto an objective lens, which was focused onto a 2048 pixel line scan camera (e2v Aviiva em2 CL 2014). The all-reflective spectrometer of the 1300 nm system was based on Czerny-Turner configuration, using an Indium Gallium Arsenide (InGaAs) 1024 pixel line scan camera (Sensors Unlimited Inc., Princeton, NJ, USA) as the detector. A superluminescent laser diode source (Thorlabs Inc.) centered at 1320 nm with an FWHM bandwidth of 100 nm, yielding an axial resolution of approximately 7 μm, was employed in the 1300 nm system. The details of the individual spectrometer components and design have been previously described . Both OCT systems were capable of acquiring images simultaneously at a rate of 47 kHz. Electronic data from both cameras were transferred to a dual port frame grabber, PCIe-1430 (National Instruments) by two standard Camera Link connections. Scanning patterns and the timing of image acquisition of these two systems were synchronized using a field programmable gate array, PCI-7830R (National Instruments, Austin, TX, USA). All the digital and analog functionalities of the OCT system, such as various image acquisition parameters, scanning patterns and realtime preview, were configured using LabVIEW (National Instruments). 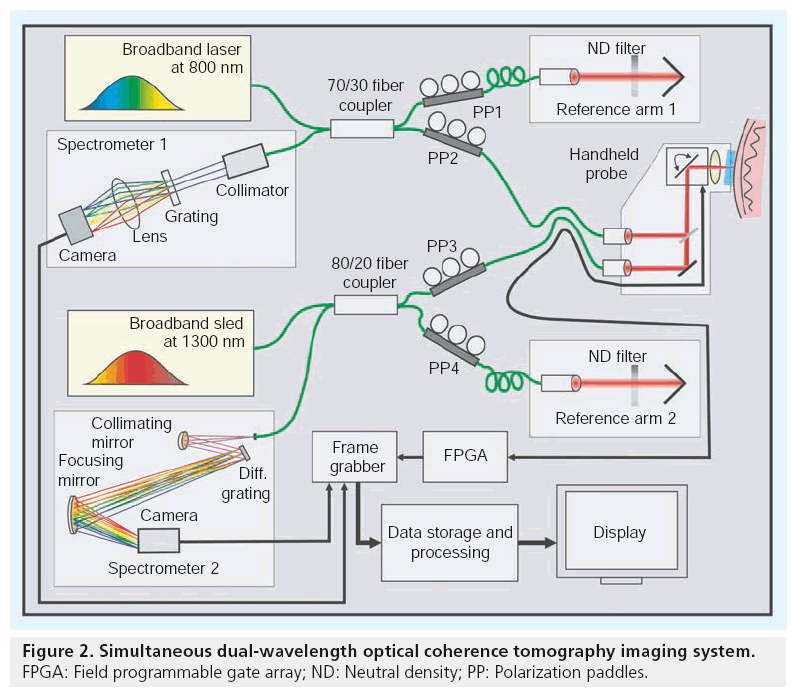 Figure 2: Simultaneous dual-wavelength optical coherence tomography imaging system. FPGA: Field programmable gate array; ND: Neutral density; PP: Polarization paddles. Besides optimization of penetration depth, resolution and sensitivity, one of the most critical parameters for OCT in clinical dermatologic applications is the design of the imaging probe. Ideally, the light delivery probe has to be lightweight and flexible enough to be easily manipulated by the operator to be precisely orientated in a stable position, but still needs to cover a wide field at high optical quality. This necessitates a compact patient interface combined with a small integrated detection unit or optical fiber-based designs. The delivery probe design for the dual wavelength OCT system incorporated a specially designed broadband, large field of view objective for telecentric operation in the 700–1400 nm range with a focal length of 36 mm and approximately 14 mm diameter field of view (Thorlabs, LSM04-BB). In combination with a closedpair galvanometric scanning unit (Cambridge Technologies Inc., Lexington, MA, USA), a field of approximately 10 × 10 mm² could be covered in a single scan with very small distortions. Both OCT systems were interfaced to the probe via fiber-optic cables. In accordance with the Nyquist criterion, high-density sampling was performed across the samples simultaneously with both OCT systems at twice their transverse resolution of 12 and 15 μm, respectively. To ensure proper focusing and correct positioning of the sampling region, the objective was connected to an independently adjustable sapphire-glass window at an inclination of greater than 8° with respect to the incident beam. Together with an index matching fluid, the strong primary backreflection of the air-tissue interface (~-26 dB) was avoided and the much weaker internal tissue reflections (~-60 to -110 dB) could be unveiled. To reduce surface reflections, an index matching fluid is also used during dermatoscopy. A biocompatible material with smoothed edges that encased a scratch-resistant sapphire window of 25 mm diameter completed the patient interface. Within the handheld device, the independently collimated 800 and 1300 nm sample arm beams were combined on the way to the sample and were separated on the way back to the OCT core using a dichroic beam splitter. On the skin, the incident power at the two wavelengths was 9 and 7 mW, respectively, to comply with local irradiation safety limits based on the International Commission on Non-Ionizing Radiation Protection standards . Volumetric data of the scanned region was reconstructed by processing the spectral interference data obtained from each depth-scan through several linearization and correction stages using a final fast Fourier-transform (FFT) to reveal the depth information. For highly scattering tissues, the depth-dependent signal reduction and shadow artifacts can be removed by applying FFT filters and through the compression of the extremely high dynamic range to improve contrast in high and low intensity regions. The effect of depthdependent signal attenuation in OCT B-scans of thick volumes can be minimized to some extent by these image processing steps, which then assists in correlating them to evenly illuminated histopathology of the thick specimen. OCT images obtained from the glabrous and the hairy skin are displayed in Figure 3. The structure of glabrous skin, as found on the palm, allows for better discrimination of different cutaneous layers in the OCT tomogram. All major skin layers, including sublayers of the EP and dermis, could be well delineated using OCT due to pronounced differences in scattering. The OCT image of the glabrous skin was obtained from the fold above the proximal interphalangeal joint of the middle finger (Figure 3A). The stratum corneum (SC) appears as a thick and transparent region in the glabrous skin, just underneath the narrow bright scattering layer of stratum disjunctum. The viable EP (VE) layer, delineated by the stratum lucidum and composed of the stratum granulosum, the stratum spinosum and the stratum basale (SB), appears as a highly reflective layer between the less scattering layers of the SC and the papillary dermis (PD). 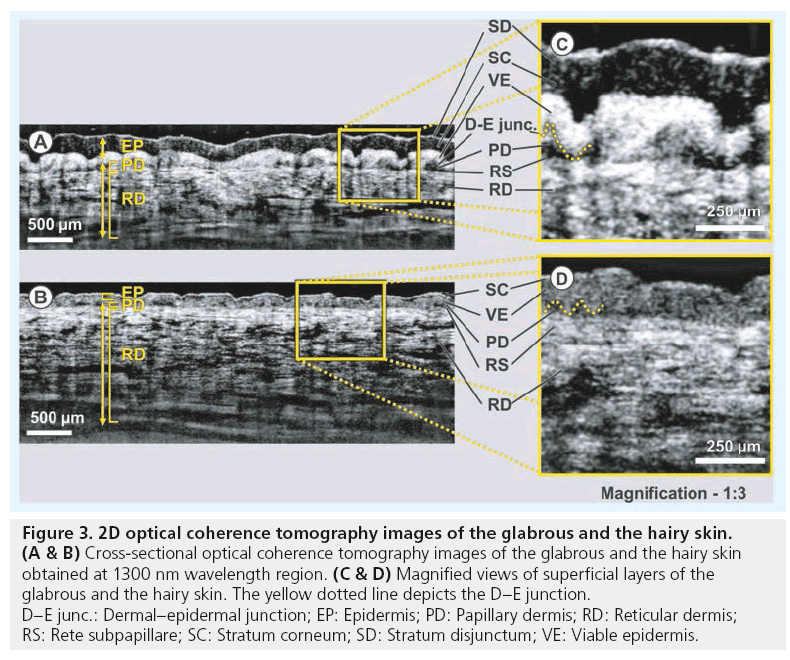 Figure 3: 2D optical coherence tomography images of the glabrous and the hairy skin. (A & B) Cross-sectional optical coherence tomography images of the glabrous and the hairy skin obtained at 1300 nm wavelength region. (C & D) Magnified views of superficial layers of the glabrous and the hairy skin. The yellow dotted line depicts the D–E junction. D–E junc. : Dermal–epidermal junction; EP: Epidermis; PD: Papillary dermis; RD: Reticular dermis; RS: Rete subpapillare; SC: Stratum corneum; SD: Stratum disjunctum; VE: Viable epidermis. In glabrous skin, the absence of melanocytes in the SB and the undulations of dermal papillae make it hard to clearly demarcate the boundary between the EP and the dermis. The PD is easily distinguished from the highly scattering reticular dermis (RD) by the dense network of lymphatic and blood capillaries, known as the rete subpapillare. The PD, composed of fine collagen, elastin fibers and small blood vessels arising from the rete subpapillare, seems to be less scattering when compared with the RD, which comprises thick and compact collagen and elastin fibers . The thickness of the SC layer varies from approximately 200 μm in glabrous skin to approximately 20 μm in hairy skin . Here the SC appears as a bright narrow line on the surface in the cross-sectional images obtained from hairy skin located above the dorsal forearm. The SC is followed by a lowly scattering region of the VE, which includes all sublayers of EP except the SC, and a bright layer corresponding to the SB. This layer is more distinct in hairy skin due to the higher concentration of melanin-rich compartments, known as melanosomes, in this region of EP (Figure 3B). Similar to the glabrous skin, the less scattering PD layer can be easily distinguished from the bright RD in the hairy skin too. 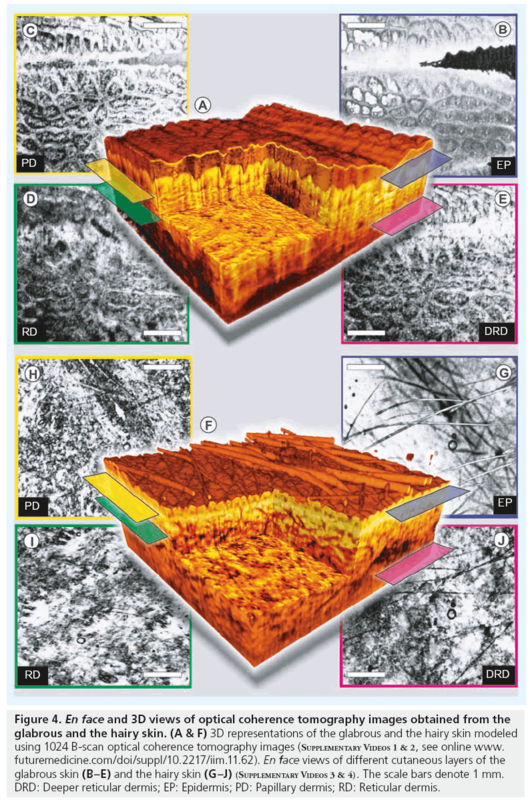 The magnified views of the upper portions of the OCT cross-sections obtained from the glabrous and the hairy skin are shown in Figure 3C and Figure 3D, respectively. Figure 4 shows 3D renderings of the glabrous and the hairy skin constructed using a densely sampled raster 1024 × 1024 depth scans, corresponding to a scan area of 8 × 8 mm. These cut-through 3D models of human skin reconstructed from OCT images obtained in vivo depicts the capability of OCT to perform ‘optical biopsy’ revealing micromorphological details of various skin layers (Figure 4A & 4F). Averaged en face views of the same volumes sampled at different depths unveil different morphological structures more clearly due to the stratified nature of human skin. In the en face section obtained close to the SC layer of the glabrous skin, the parallel ridges formed by the underlying dermal papillae can be clearly seen, where sections of helical sweat ducts are visible as bright spots (Figure 4B). The second en face section obtained from the PD is easily recognized by its characteristic honeycomb-like appearance formed by fibrous stroma of the RD around the less scattering base of PD. The sections obtained from the upper regions of the RD and the deeper RD is characterized by strongly scattering collagen and elastic fibers with a rich supply of blood vessels and lymphatic networks, which appear as signal-poor regions. The en face section of the EP obtained from the hairy skin above dorsal forearm shows fine grooves (sulci cutis) on the skin surface overcast by shadows from hair (Figure 4G). The lesser prominence of dermal ridge pattern in hairy skin in comparison with the glabrous skin is evident from the en face section showing the PD (Figure 4H). The dense fibrous RD layer with blood vessels and other skin appendages has comparable appearances in both glabrous and hairy skin. 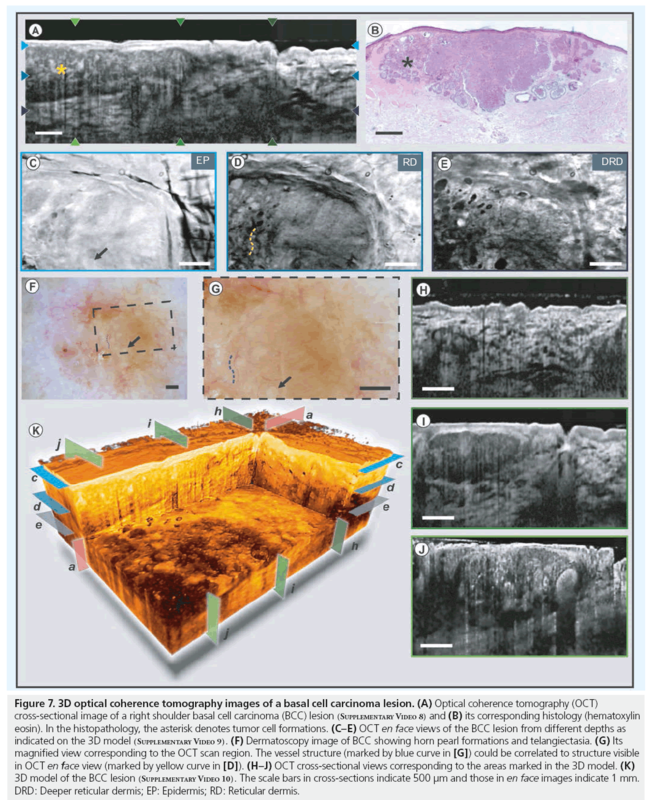 Figure 4: En face and 3D views of optical coherence tomography images obtained from the glabrous and the hairy skin. (A & F) 3D representations of the glabrous and the hairy skin modeled using 1024 B-scan optical coherence tomography images (Supplementary Videos 1 & 2, see online www. futuremedicine.com/doi/suppl/10.2217/iim.11.62). En face views of different cutaneous layers of the glabrous skin (B–E) and the hairy skin (G–J) (Supplementary Videos 3 & 4). The scale bars denote 1 mm. DRD: Deeper reticular dermis; EP: Epidermis; PD: Papillary dermis; RD: Reticular dermis. As the scattering of light decreases with wavelength, longer wavelength regions in the nearinfrared region are preferred for skin imaging applications. Figure 5A shows OCT images of the hairy skin obtained with three different OCT systems operating at center wavelengths of 800, 1060 and 1300 nm. The decay of normalized OCT signal intensities with depth in hairy skin at different wavelength regions is plotted on the right (Figure 5B). The transition between different dermal sublayers can be identified by peaks along these signal decay curves. These plots show that the OCT signal intensity attenuates at a faster rate when employing lower wavelength regions. However, it can be seen from the displayed cross-sections that the image contrast between different layers is higher for lower wavelength regions. Another interesting remark on OCT signal attenuation in skin is that the majority of the OCT signal gets attenuated in the densely scattering RD layer . Figure 5: Effect of wavelength and melanin pigmentation in optical coherence tomography. (A) Optical coherence tomography images obtained from the hairy skin at 800, 1060 and 1300 nm, respectively. (B) Averaged signal decay curves at these three wavelength regions. (C) Optical coherence tomography images obtained at 1300 nm wavelength region from skin types II, IV and VI, respectively. (D) Averaged signal decay plots in these three skin phototypes. Adapted from . Melanin, the pigment that functions as the primary UV-absorbent in human skin, influences the penetration of visible light into skin and hence is considered to affect the imaging depth of OCT. 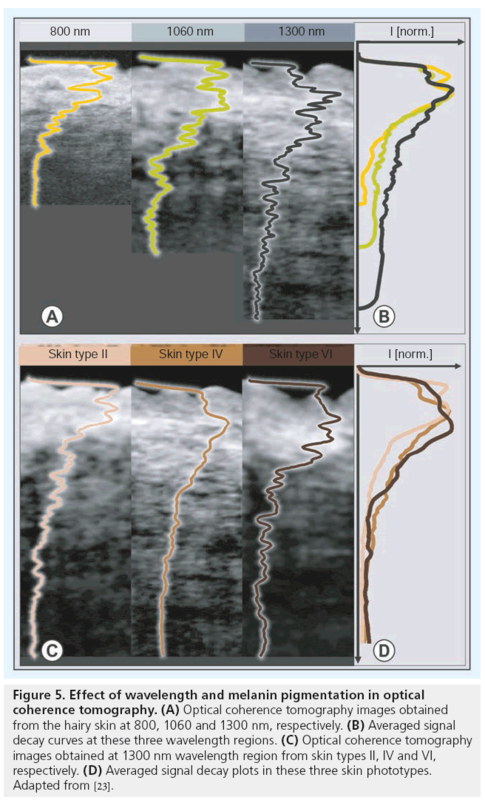 Figure 5C shows images of dorsal forearm skin obtained from three skin phototypes II, IV and VI (Caucasian, Indian and African)  using an OCT system operating at the 1300 nm wavelength region in order to determine the effect of skin pigmentation in OCT. As shown by the signal decay curves on the right of Figure 5D, the melanin pigmentation did not seem to affect penetration depth of OCT. For wavelengths greater than 600 nm, scattering is mainly due to large scatterers, such as collagen and elastin bundles, in the dermis . Hence, melanin, which behaves as small Rayleigh scatterers in a healthy skin, does not contribute significantly to the scattering of light in the near-infrared wavelength region. Squamous cell carcinoma (SCC) of the skin is the second most common form of nonmelanoma skin cancer. The characteristic clinical appearance of SCC is that of a pink, scaly or crusted papule or plaque. However, this may vary considerably, from flat lesions with illdefined borders, resembling actinic keratosis (AK), to large, verrucous (as shown in dermatoscopy Figure 6J & 6K), ulcerated and invasive lesions. In some cases, SCC may also present as an ill-defined sclerotic plaque, a cutaneous horn or a deep, penetrating, cyst-like lesion. Figure 6: 3D optical coherence tomography images of a squamous cell carcinoma lesion. (A) optical coherence tomography (OCT) cross-sectional image of healthy skin (middle finger, adjacent to tumor, glabrous skin) and (B) its corresponding histology (hematoxylin eosin). Epidermal and dermal structures are preserved. (C–E) OCT en face views of the healthy skin from different depths indicated by arrows on the cross-sectional image. (F–H) OCT en face views of the SC carcinoma (SCC) lesion from different depths indicated by arrows on the pathology cross-section (Supplementary Video 5). (I) 3D model of the SCC lesion (Supplementary Video 6). (J) Dermatoscopy image of the verrucous SCC lesion and (K) its magnified view corresponding to the OCT scan region. (L) OCT cross-sectional image of the SCC lesion (Supplementary Video 7) and (M) its corresponding histopathology (hematoxylin eosin). (N & O) Magnified views of OCT images obtained at 800 and 1300 nm from the region marked by the yellow box in (L), and (P) is corresponding histopathology of the magnified region. The broadened EP hyperkeratotic stratum corneum (marked by asterisk) is visible in OCT and corresponds well with the histopathology. The scale bars in cross-sections indicate 500 μm, except in (N, O & P) and those in en face images indicate 1 mm. DRD: Deeper reticular dermis; EP: Epidermis; PD: Papillary dermis; RD: Reticular dermis; SC: Squamous cell. Histopathological findings include atypical squamous cell nests, arising from the EP as well as large amounts of keratin with keratin pearl formations, depending on the differentiation of the tumor. Figure 6 compares SCC on the left index finger with neighboring healthy skin obtained at the 1300 nm wavelength region. As can be seen from the OCT images and corresponding histology, the structure of dermal layers is preserved in healthy skin (Figure 6A–6E). As shown in Figure 6L, the pathologic case shows a clear disruption of the layered architecture. The inset of Figure 6N & 6O represents magnified views of epidermal structures in the malignant region obtained at 800 and 1300 nm, respectively. Hyperparakeratosis, which is characterized by a thickening of the SC, accompanied by a broadened granular cell layer, could be well delineated using OCT due to significant difference in scattering induced by the keratin structures. The higher contrast between different epidermal structures in the OCT images obtained at 800 nm in comparison to those obtained at 1300 nm is visible in these magnifications. However, further research is necessary to distinguish parakeratosis, where alterations of the intracellular structure can affect the backscattering profile and the signal intensity. The en face perspective contrasts the lateral extent of the malignant and normal regions within the imaged volume. The brighter normal regions can be distinguished from the darker affected regions due to the different backscattering properties. In the boundary region (light gray), the gradual loss of structure is well visible before complete rearrangement inside the tumor tissue (Figure 6F–6H). En face views obtained from the EP (Figure 6F) overlay perfectly on the dermatoscopy image (Figure 6K). This helps to identify the OCT scan location and correlate the structures visible in OCT to that of histology and dermatoscopy (black dashed box in Figure 6J). The en face views at different depths allow determination of the nature and extent of tumor invasion. Figure 6I shows a 3D cut-through model of the SCC lesion constructed using 512 OCT B-scans. As the clinical appearance of SCC may be quite similar to that of AK or BCC, only via biopsy can these tumors be properly identified as containing significant cytologic atypia with an invasive component . Histological characteristics of AK are the change of orthoand hyperparakeratosis, distinct actinic elastosis and the missing involvement of adnex structures. The borders to the healthy EP are usually well defined. These formations are epidermal, do not invade into the dermal layer and can therefore be easily distinguished by OCT. Since a significant proportion of SCCs occur in areas of extensive sun damage, the majority of cases in Caucasian skin do arise in AK. The treatment of choice is that of microscopically controlled surgery in order to prevent incomplete tumor excision. In this scenario, OCT can be a promising imaging tool in determining the invasive nature of the tumor and its spatial dimensions, as well as in verifying the presence of any malignant regions that may remain along the tumor margins during the surgery. BCC is the most common tumor in Caucasian skin . Although its degree of malignancy is low, its growth is locally destructive. Some BCCs infiltrate with finger-like projections into depth, caused by irregular growth, which are not obvious from visual inspection . As the recurrence rates with different safety margins indicate, highly resolved pre-interventional demarcation of tumor borders could positively affect success rates of less invasive treatments. Untreated, BCC may infiltrate the surrounding tissue and even penetrate into the bone. Yet, it rarely develops to a metastatic disease . The diagnosis of BCC may be challenging, as it appears in many different colors and shapes. Punch biopsies are often necessary to distinguish it from melanoma, SCC or sebaceous gland hyperplasia. Histological findings include palisade-like tumor cell masses of either solid pattern, with central necrosis or (micro-)cyst formations located within the dermal layer. If excised incompletely, BCC will recur. Therefore, it is necessary to detect the exact 3D tumor margins in order to perform complete excision. Figure 7 shows images obtained from a right shoulder BCC lesion. This BCC lesion appears as a weakly scattering homogenous lesion in the OCT cross-section and its boundaries with the healthy tissue could be identified from the differences in backscattering properties (Figure 7A). It has to be noted that the demarcation of the tumor borders of thick sections and smaller infiltrations still remains to be verified with histology and follow-up studies are required to obtain reliable quantitative information. 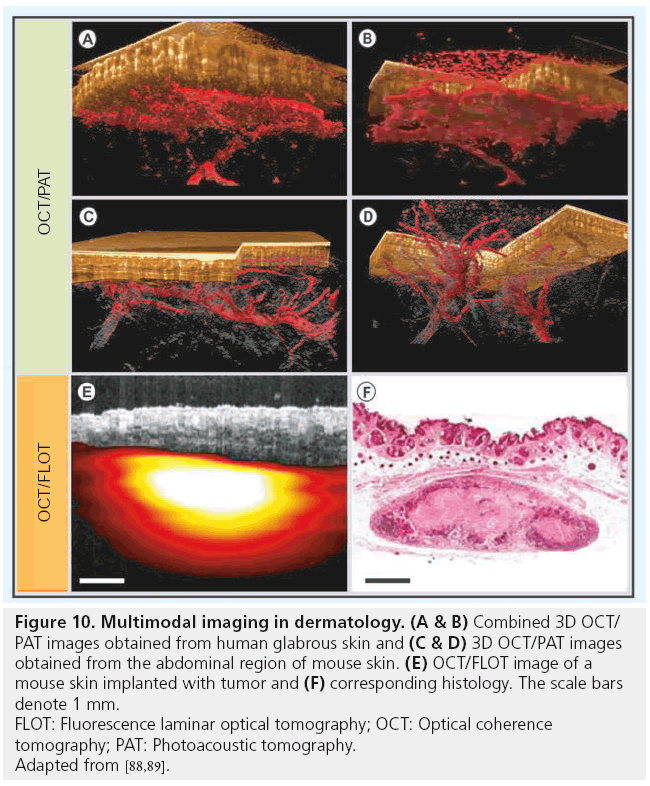 The 3D cut-away section, shown in Figure 7K, demonstrates the capability of OCT to determine the spatial extent of the tumor mass in 3D and to assess the degree and nature of malignant transformation. Tumor cell nests within the BCC lesion can also be seen in the crosssectional (Figure 7H–7J) and en face OCT images (Figure 7C–7E). The structures seen in these OCT images were confirmed through comparison with corresponding histology (Figure 7B), where an epithelial tumor built from basal-like cells with palisade-like formations in irregularly shaped aggregates, reaching the cutis/subcutis border can easily be identified. However, a challenge for optical imaging modalities can be intensive thickening of superficial structures, either by cellular or extracellular materials, as in hyperkeratosis or crust formations. In these cases, multiple parameters of the constituent materials, such as particle size, nature and its distribution, affect OCT imaging performance. The dermatoscopy images are displayed in Figure 7F & 7G (black dashed box shows OCT scan location). The dermatoscope images and the en face OCT images show good correspondence between each other, as depicted by the arrows and curves. Figure 7: 3D optical coherence tomography images of a basal cell carcinoma lesion. (A) Optical coherence tomography (OCT) cross-sectional image of a right shoulder basal cell carcinoma (BCC) lesion (Supplementary Video 8) and (B) its corresponding histology (hematoxylin eosin). In the histopathology, the asterisk denotes tumor cell formations. (C–E) OCT en face views of the BCC lesion from different depths as indicated on the 3D model (Supplementary Video 9). (F) Dermatoscopy image of BCC showing horn pearl formations and telangiectasia. (G) Its magnified view corresponding to the OCT scan region. The vessel structure (marked by blue curve in [G]) could be correlated to structure visible in OCT en face view (marked by yellow curve in [D]). (H–J) OCT cross-sectional views corresponding to the areas marked in the 3D model. (K) 3D model of the BCC lesion (Supplementary Video 10). The scale bars in cross-sections indicate 500 μm and those in en face images indicate 1 mm. DRD: Deeper reticular dermis; EP: Epidermis; RD: Reticular dermis. One of the potential clinical applications of OCT in dermato-oncology is NMSC diagnosis. To correctly identify skin pathologies via OCT, the recognition of healthy skin is a prerequisite. As shown in Figures 3 & 4, the cutaneous layers can be easily detected. However, OCT imaging of highly pigmented, melanocytic skin tumors is often restricted due to the increased scattering and absorption of light, limiting OCT penetration that would be necessary to evaluate tumor thickness or distinguish cellular morphologies . In most of the melanoma lesions and pigmented nevi, melanocytes tend to form cell nests or complexes with extracellular materials, such as fibroblasts and endothelial cells, which alters their scattering behavior . The increased scattering of light due to these factors limits the capability of OCT to investigate highly pigmented lesions. For BCCs and SCCs (including AK), OCT appears to be applicable in order to illustrate the corresponding tumor cell formations (Figures 6 & 7). The typical OCT identification criteria for BCCs includes altered skin structures as well as tumor cell nests accompanied by tumor cavities, infiltrating into the dermis, that also show good histopathological correlation (Figure 6). Nevertheless, the differentiation between BCC subtypes (e.g., nodular, superficial, sklerodermiform and infiltrative) was not possible by means of OCT alone  and needs further studies with high-resolution OCT technology. There might be limitations when using OCT to investigate ulcerated crusty tumor lesions and advanced hyperkeratotic tumors, due to strong backscattering. AK represents an intraepithelial neoplasm, which is histopathologically identified by hyper- and para-keratosis alternating with orthokeratosis and the elision of adnex structures. OCT images show white dots and streaks corresponding to hyperkeratosis [51,66]. AKs are easily recognized and differentiated from healthy skin through OCT . However, morphological differences visualized using OCT is not sufficient enough for differentiating AK from SCC or BCC . If untreated, AK will develop into SCC. As seen in Figure 6, the hyperkeratosis of the SC, characteristic in SCC, can be easily identified and correspond well to the corresponding histopathology, which indicates the clinical usefulness of dermal OCT imaging. Several clinical trials have been conducted to demonstrate the potential capabilities of OCT in NMSC detection [24,46,66]. Timely detection of NMSC and subsequent total excision are essential to prevent tumor recurrence and spreading. Nowadays, accurate diagnostics in dermato-oncology are time consuming, expensive and personally demanding procedures, with histopathology still being considered as the gold standard method for identifying skin tumor formations. Even if accompanied by dermatoscopy, differentiation of benign and malignant skin lesions largely depends upon the clinician’s ability and knowledge. The development of new in vivo imaging techniques, that allow precise and practically on-line diagnosis, opens up a new range of possibilities in the field of dermato-oncology. In vivo identification of tumor structures and boundaries would allow complete tumor excisions and spare the patients a second or third operation. The frequently performed diagnostic punch biopsy could be avoided and the overall treatment time would be reduced. Apart from assisting in clinical diagnostic procedures, noninvasive in vivo imaging would allow the observation of dynamic processes such as topical tumor treatment, which is frequently performed in NMSC. Although ultra-high resolution OCT delivers high quality in vivo images and enables differentiation of various cutaneous layers in real time, its potential to deliver anatomical and functional information can further be enhanced by incorporating additional contrast-enhancing methods. Histopathology has the advantage of including chemical information via a vast range of exogenous labeling mechanisms, which readily allows the identification and molecular distinction of the pathological condition. Several investigations have been performed in recent years to increase tissue-specific contrast in OCT for extraction of complimentary functional information . In the current study, the OCT system was extended by a secondary OCT channel for simultaneous acquisition of two well-separated wavelength channels: the 800 nm band providing higher contrast and resolution was combined with the 1300 nm band for deeper penetration, at the cost of resolution. Thus, this hybrid device helps to combine the advantages of both wavelength bands, additionally to the different spectral response of tissue. Dual-wavelength OCT can be used as a contrast enhancement method utilizing the variations in light–tissue interactions at these wavelength bands [68,69]. 3D OCT images of a BCC lesion obtained from the skin above the forehead region are displayed in Figure 8. OCT cross-sections showing the tumor mass towards its right are shown in Figure 8A–8C (marked with asterisk). Figure 8A & 8B shows OCT images of the lesion obtained at 800 and 1300 nm color coded in green and red, respectively. These sections were registered and combined summing up their spectral content to obtain the contrast-enhanced image in Figure 8C. The en face sections obtained from the depths, indicated by the markers on the cross-sectional images, are displayed in Figure 8D–8I. As can be seen from Figure 8F, the contrast between the tumor and normal regions could be enhanced by combining the 800 nm image colored in green and the 1300 nm image colored in red. The tumor boundary and tumor cell nests within the lesion could be better identified in the combined image. The complimentary information obtained from both wavelength regions is visible as shades of green, brown and red in the combined images. Figure 8G–8I show dual wavelength en face images sectioned from a deeper dermal region. The increased amount of reddish shades in the combined image depicts the dominant contribution of 1300 nm OCT signal over 800 nm signal from deeper layers, which is due to the difference in scattering and absorption properties of the more superficial tissues (Figure 8I). Figure 8: Contrast enhancement using simultaneous dual-wavelength imaging. (A & B) Optical coherence tomography cross-sectional images of a basal cell carcinoma lesion obtained at 800 and 1300 nm, respectively. (C) Combined image of (A) and (B) showing enhanced contrast of different dermal structures. The asterisks in the cross-sectional images show the tumor mass formations. (D–I) En face views mapped in different colors obtained from depths as indicated in the cross-sections. (D & E) 800 nm en face image of the basal cell carcinoma lesion colored in green and 1300 nm image colored in red. (F) En face dual wavelength (800 and 1300 nm) combined image showing enhanced contrast of tumor boundaries and structures. (G & H) 800 and 1300 nm en face images colored in green and red, respectively, obtained from deeper regions of the dermis. (I) Dual wavelength combined image showing dominance of 1300 nm signal at deeper regions. The scale bars indicate 500 μm and those in en face images indicate 1 mm. Another extension to OCT to increase contrast based on the altered properties of the illumination is the detection of polarization effects [70,71]. Polarization-sensitive OCT (PS-OCT) provides additional information of tissue polarization properties simultaneously with morphological information by detecting the depth-resolved polarization state changes of the backscattered light. Biological tissues, such as skin, have various polarization properties: birefringence, diattenuation and depolarization. Different preclinical and clinical studies have been performed to demonstrate the potential of PS-OCT in skin [72–74]. Figure 9A–9D displays conventional (Figure 9A & 9C) and PS-OCT (Figure 9B & 9D) images obtained in vivo from the skin of a mouse cancer model (adapted from ). The cancer region appeared as a highly scattering region in both conventional and PS-OCT images. However, the tumor regions could be demarcated better in the PS-OCT images due to the differences in tissue birefringence, mainly caused by the different organization of extracellular fibers. 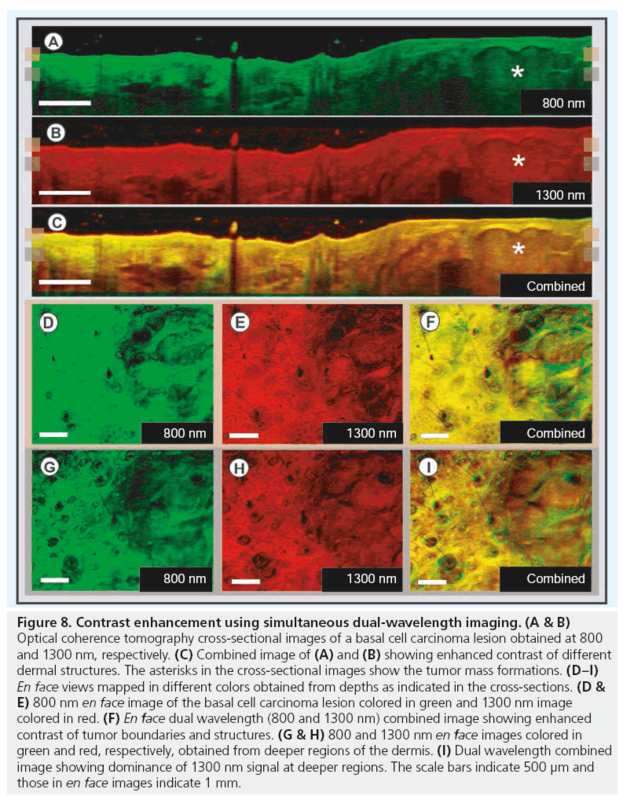 Figure 9: State-of-the-art extensions of dermatologic optical coherence tomography. (A–D) Contrast enhancement using polarization-sensitive OCT. (A & B) Conventional OCT and PS-OCT images showing tumor implanted in a mouse cancer model and (C & D) their respective en face sections. (E–K) Microvascular imaging using Doppler and correlation mapping OCT. (E) 3D human skin model constructed using D-OCT showing vascular network distribution in palmar region. (F–H) En face views of same region from different depths and (I) vascular information from different depths distinguished using different color coding mapped onto a single en face section. (J) 3D model of human skin constructed from cmOCT images and (K) maximum intensity projection of vascular information obtained using cmOCT onto an en face section. cmOCT: Correlation mapping optical coherence tomography; D-OCT: Doppler OCT; OCT: Optical coherence tomography; PS: Polarization-sensitive. Adapted from [73,78,79]. Since standard OCT primarily encodes reflectivity, only little intrinsic molecular-specific labeling is possible. Compared to endogenous label-based techniques such as autofluorescence, MPT, coherent anti-Stokes Raman scattering (CARS) and other similar modalities, conventional OCT primarily based on the coherent linear optical response associated with tissue backscattering is limited in extracting functional information. Doppler OCT (D-OCT), similar to color Doppler ultrasound, is one of the extensions of OCT capable of performing functional measurements by analyzing the spectral phase shift of the optical signal due to the motion of blood cells with respect to the direction of the incident beam [75–77]. 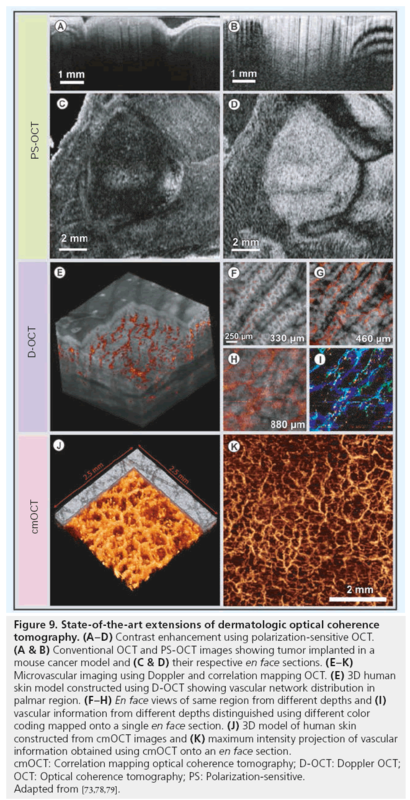 Figure 9E shows a 3D rendering of the D-OCT images obtained in vivo, enabling the visualization of microvasculature across different layers of human skin (adapted from ). En face projections obtained from regions close to D–E junction displaying smaller vertical capillaries and from deeper dermal layers showing larger vessels are displayed in Figure 9F–9H. The 3D capillary network is visualized in Figure 9I, which is constructed by depthdependent color-coding of different en face projections in red, green and blue color channels. Correlation mapping OCT (cmOCT) is another extension of OCT capable of extracting flow information merely from OCT signal intensity, without the requirement of phase information . A 3D rendering and a maximum intensity projection of cmOCT images obtained from human volar forearm are shown in Figure 9J & 9K (adapted from ). Likewise, optical microangiography is a recently developed imaging approach with very high sensitivity, which has been successfully demonstrated in visualizing the microvascular network in human skin in vivo . Another extension of OCT, known as optical coherence elastography, was demonstrated to determine elastic properties of skin by evaluating the nonlinear compression of tissue when applying dynamic pressure . Recently, there has been a growing interest in biomedical research to combine multiple imaging modalities yielding complimentary contrast to obtain microstructural and functional information of biological tissues simultaneously. Anatomical imaging modalities, such as OCT, diffuse optical tomography, MPT and CM were combined with functional imaging modalities such as Raman spectroscopy, photoacoustic tomography (PAT) and fluorescence imaging to improve the sensitivity and specificity of the imaging application [6,82–85]. Angiogenesis is one of the most critical parameters associated with tumor malignancy. As mentioned in the previous section, OCT is capable of extracting microvascular information with high resolution and sensitivity. However, its limited penetration depth is a major problem in evaluating the vascular distribution, including the surrounding feeder vessels in a multiple millimeter thick tumor lesion. PAT is a noninvasive in vivo imaging modality capable of acoustically mapping the thermomechanic response to optical absorption of nanosecond laser pulses within the tissue . Hemoglobin being one of the major optical absorbers in the human skin, this technique is capable of visualizing cutaneous vasculature using light at the 680 nm band with a spatial resolution in the order of tens of micrometers and a penetration depth of several millimeters . Recently, a multimodal PAT/OCT system for imaging human skin in vivo has been demonstrated employing an integrated, all optical detection scheme using a Fabry–Perot interferometric mirror for operation in epi-direction . Figure 10A & 10B display a coregistered OCT/ PAT image obtained in vivo from the human palmar region and Figure 10C & 10D show a multimodal image obtained from mouse skin near the abdominal region (adapted from ). As can be seen from these figures, multimodal OCT/PAT device integrates the structural information from OCT in the first millimeter covering the EP, the PD and the RD, with the vascular information obtained by PAT in the same region, but also extending down to a depth of 5 mm. With improvements in the sampling speed and resolution, PAT/OCT is a very promising method for clinical dermatologic applications. 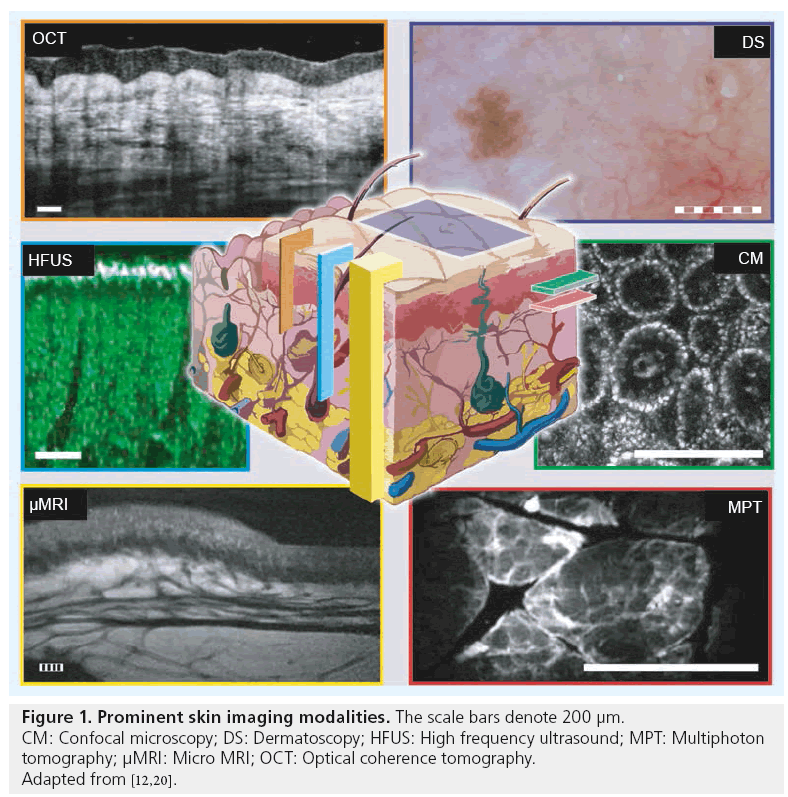 Figure 10: Multimodal imaging in dermatology. (A & B) Combined 3D OCT/ PAT images obtained from human glabrous skin and (C & D) 3D OCT/PAT images obtained from the abdominal region of mouse skin. (E) OCT/FLOT image of a mouse skin implanted with tumor and (F) corresponding histology. The scale bars denote 1 mm. FLOT: Fluorescence laminar optical tomography; OCT: Optical coherence tomography; PAT: Photoacoustic tomography. Adapted from [88,89]. In another multimodal study, OCT was combined with fluorescence laminar optical tomography (FLOT) to provide depth-resolved, structural and molecular tissue information at the millimeter imaging scale . Figure 10E & 10F displays a fused OCT-FLOT image and the corresponding histology of a subcutaneous human breast xenograft in a mouse model obtained in vivo (adapted from ). Breast cancer cells (MDA-MB-231) were constitutively labeled with tdTomato red fluorescence protein. Although, the resolution of FLOT is significantly lower compared with that of OCT, FLOT is sensitive to biochemical information, which is important for the assessment of tissue physiology. A Raman spectroscopy/OCT multimodal system capable of sequentially acquiring Raman scattering and OCT images along a common optical axis for evaluating wound healing has been demonstrated . This device compensates the lack of molecular specificity in OCT with the biochemical specificity of Raman spectroscopy. A multimodal MPT/OCT system was used in a clinical trial to investigate a variety of skin diseases, such as skin cancer, psoriasis, hemangioma and bullous skin diseases, to combine the flexibility and relatively large scanning range of OCT with the subcellular resolution of MPT . The results of this trial study proved the MPT/OCT approach to be a powerful optical imaging tool for early skin cancer diagnostics and for the evaluation of treatments. In the last 15 years, significant improvements have been made in dermatologic OCT in terms of image resolution, quality and acquisition speed. High-speed FD-OCT devices featuring close to cellular-level resolution and 1–2 mm penetration depth across scan fields greater than 1 cm² have been shown to be clinically useful for dermatologic diagnostics. As demonstrated in this review, OCT is a promising imaging technique capable of differentiating NMSC lesions and delineating tumor borders in a clinical environment. However, due to the novelty of this technique and fewer number of patients examined, further large scale clinical studies that analyze its ability to reliably improve detection rates have to be performed. Also, other tumors of this class, including merkel cell carcinoma, atypical fibroxanthoma and malignant fibrous histiocytoma, have to be investigated and correlated in detail with the histopathological findings. It has to be verified whether tumor borders visible in OCT images correlate to the borders identified by invasive techniques, especially with infiltrative types where the image quality deterioration at deeper regions can be a critical factor. Although current state-of-the-art OCT lacks commercial-grade build quality, the overall measurement times are acceptable and the procedure is not distressing for patients. Noninvasive, 3D, in vivo OCT provides an optical biopsy, which allows visualization of micromorphological volumes and can help determine the nature and degree of tumor invasion. The structural information obtained by OCT can be utilized in various clinical procedures, such as surgical planning and treatment monitoring. Critical improvements are facilitated by noninvasive imaging techniques such as OCT, where conventional diagnostic means often fail to deliver with sufficient reliability, such as in preinterventional planning of tumor resection. Contrast enhancement techniques, such as PS-OCT, and functional extensions, such as D-OCT, increase the potential of OCT in various dermatological applications. Other advanced in vivo imaging modalities, such as MPT, Raman spectroscopy, FLOT and PAT, have been tested in conjunction with OCT to obtain complimentary physiological information pertaining to the target tissue. Achieving higher resolution, deeper penetration or enhanced contrast using multimodal imaging approaches can not only provide additional details, but also allow the clinician to immediately assess the 3D morphological and functional characteristics of the target location. This information can be critical in diagnosing early-stage pathologies. Long-term monitoring of healing processes or continuous supervised nonsurgical therapy, including functional diagnostics, are additional fields in which it has been demonstrated that patients can profit from faster and more efficient optical diagnostics. Thus, this review manifests OCT as a high-speed, highresolution, noninvasive, in vivo and 3D imaging technology, capable of being a promising technique for various clinical dermatologic applications, with particular focus on NMSC diagnosis. To date, volumes or even temporal sequences of volumes (4D imaging) with multiple billion data points can be acquired within seconds using OCT. These large amounts of data present a challenge for the clinician who needs a rapid and straightforward analysis. The information bottleneck is therefore proper visualization or analysis software that can guide a clinician when rapid decisions are necessary. OCT is already established in ophthalmology, where innovations in the imaging field included higher imaging speed, deeper penetration, novel wavelengths and contrast mechanisms. Automated registration, segmentation and quantification algorithms are becoming vital for the commercial success of ophthalmic devices, which are now available from several manufacturers. For dermatologic analysis, the more complex boundaries between various dermal layers are currently becoming a challenge for computer-aided diagnostics research. In addition, increased research activities and cheaper OCT systems are signs of a maturing market that will also have an impact on the wider clinical uptake of this technology. Imaging superficial tissues such as skin demands several technical adaptations. However, the advantages of an imaging device in a clinical application is mainly measured by its ease of use, reliability and significance of the additional information delivered by the device, as well as its overall impact on costs. OCT, with good correspondence to histopathology and the high measurement speed using linear optics and relatively simple components that permit a significant reduction of costs compared with other in vivo technology, is in a favorable position to meet these requirements. Developments in dermatologic OCT, such as instantaneous visualization of multiple centimeter wide regions combined with dermatoscopy in a compact handheld probe are likely. More sophisticated detection and analysis schemes to contrast vessels based on the motion of red blood cells, polarization and spectroscopic contrast and elasticity measures will further enhance the strictly morphological information extracted. There are physical limitations, such as penetration depth, that OCT alone cannot overcome. The integration of complementary, optical- and nonoptical-based contrasting techniques with their particular advantages and disadvantages already marks a trend towards multimodal imaging, where multiple detection mechanisms can partially utilize the same technical infrastructure. As one of the relatively cheap, easily interfaced and scattering resistant high-resolution optical imaging techniques, OCT has the potential to become multiplexed with delicate and expensive techniques, such as MPT, PAT or nonlinear optical technologies, such as CARS and second harmonic microscopy, which provide finer resolution or deeper penetration and enable molecular contrast. Although most of the multimodal concepts have a great potential in research, the anatomical and physiological tissue information obtained using some of the more cost-effective multimodal imaging systems, which enable acquisition of complementary information in a single imaging session, and thereby reduce handling and waiting time, as well as the number of visits, could transform routine dermal diagnostic procedures in clinics. This will have a dramatic impact on cancer management or treatments that necessitate surgical intervention. The increased adoption of OCT might also be used for planning or monitoring less radical treatments, such as pharmacological intervention, diagnostics of injuries and wound healing processes. 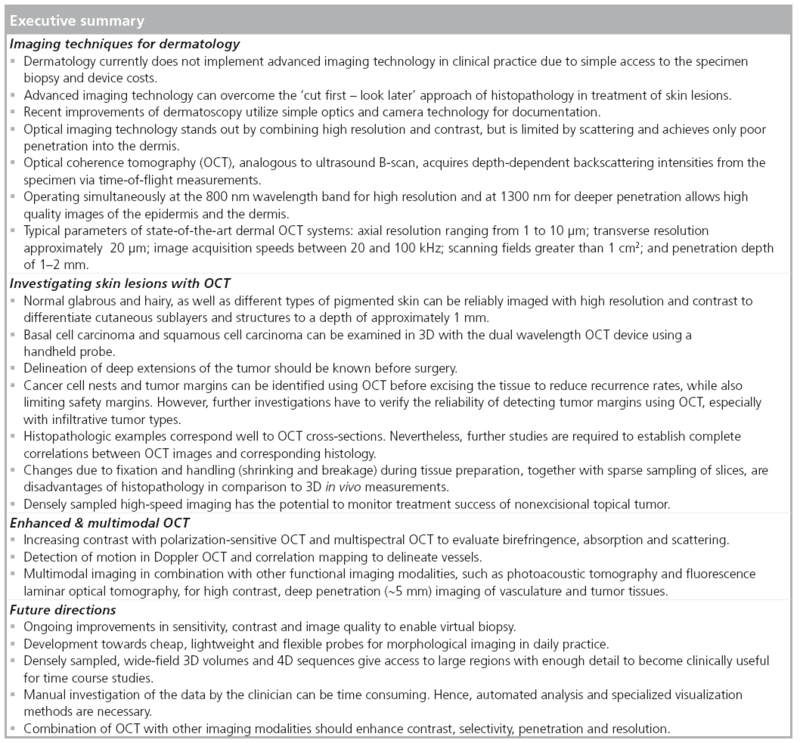 While technological development of OCT is approaching physical and biological limits, the optimization of existing imaging modalities, introduction of new imaging techniques and multimodal imaging approaches, together with advances in computer-aided diagnostics, hold the key to unlocking a vast arsenal of improvements that will propel innovation in biomedical research and daily application in dermatology clinics. The authors would like to thank Angelika Unterhuber and MG Sandrian for their technical and production support. This research was supported in part by the BBSRC, Cardiff University; DTI grant (OMICRON); AMR grant (AP1110); Medical University Vienna, European Union project FUN OCT (FP7 HEALTH, contract no. 201880), FWF-NFN ‘Photoacoustic imaging in biology and Medicine’, CARL ZEISS Meditec Inc., Femtolasers GmbH and the Christian Doppler Society (Christian Doppler Laboratory ‘Laser development and their application in medicine). The authors have no other relevant affiliations or financial involvement with any organization or entity with a financial interest in or financial conflict with the subject matter or materials discussed in the manuscript apart from those disclosed. Pehamberger H, Steiner A, Wolff K. In vivo epiluminescence microscopy of pigmented skin lesions. I. Pattern analysis of pigmented skin lesions. J. Am. Acad. Dermatol. (17), 571–583 (1987). Binder M, Schwarz M, Winkler A. Epiluminescence microscopy: a useful tool for formally trained dermatologists. Arch. Dermatol. (36), 197–202 (1995). Ruocco E, Argenziano G, Pellacani G, Seidenari S. Noninvasive imaging of skin tumors. Dermatol. Surg. 30(2 Pt 2), 301–310 (2004). Abramovits W, Stevenson LC. Changing paradigms in dermatology: new ways to examine the skin using noninvasive imaging methods. Clinics Dermatol. 21(5), 353–358 (2003). Salerni G, Carrera C, Lovatto L et al. Benefits of total body photography and digital dermatoscopy (“two-step method of digital follow-up”) in the early diagnosis of melanoma in patients at high risk for melanoma. J. American Academy of Dermatology doi:10.1016/j.jaad.2011.04.008 (2011) (Epub ahead of print). Patil CA, Kalkman J, Faber DJ, Nyman JS, Van Leeuwen TG, Mahadevan-Jansen A. Integrated system for combined Raman spectroscopy–spectral domain optical coherence tomography. J. Biomed. Opt. 16(1), 011007–011007 (2011). Cong Phuoc H, Robles-Kelly A. Hyperspectral imaging for skin recognition and biometrics. Presented at: 17th IEEE International Conference on Image Processing. Hong Kong, China, 26–29 September 2010. Woodward RM, Wallace VP, Pye RJ et al. Terahertz pulse imaging of ex vivo basal cell carcinoma. J. Invest. Dermatol. 120(1), 72–78 (2003). Harland CC, Bamber JC, Gusterson BA, Mortimer PS. High frequency, high resolution B-scan ultrasound in the assessment of skin tumours. Br. J. Dermatol. 128(5), 525–532 (1993). Desai TD, Desai AD, Horowitz DC, Kartono F, Wahl T. The use of highfrequency ultrasound in the evaluation of superficial and nodular basal cell carcinomas. Dermatol. Surg. 33(10), 1220–1227 (2007). Petrella LI, Valle HA, Issa PR, Martins CJ, Pereira WCA, Machado JC. Study of cutaneous cell carcinomas ex vivo using ultrasound biomicroscopic images. Skin Res. Technol. 16(4), 422–427 (2010). Stefanowska J, Zakowiecki D, Cal K. Magnetic resonance imaging of the skin. J. Euro. Acad. Dermatol. Venereol. 24(8), 875–880 (2010). Laistler E, Loewe R, Moser E. Magnetic resonance microimaging of human skin vasculature in vivo at 3 Tesla. Mag. Reson. Med. 65(6), 1718–1723 (2011). Ulrich M, Astner S, Stockfleth E, Röwert- Huber J. Noninvasive diagnosis of nonmelanoma skin cancer: focus on reflectance confocal microscopy. Exp. Rev. Dermatol. 3(5), 557–567 (2008). Nehal KS, Gareau D, Rajadhyaksha M. Skin imaging with reflectance confocal microscopy. Semin. Cutan. Med. Surg. 27(1), 37–43 (2008). Buzug TM, Schumann S, Pfaffmann L, Reinhold U, Ruhlmann J. Functional infrared imaging for skin-cancer screening. In: Conference Proceedings of IEEE Engin. Medicine and Biology Society. 2006. Segura S, Puig S, Carrera C, Lecha M, Borges V, Malvehy J. Non-invasive management of non-melanoma skin cancer in patients with cancer predisposition genodermatosis: a role for confocal microscopy and photodynamic therapy. J. Euro. Acad. Dermatol. Venereol. 25(7), 819–827 (2011). Andresen V, Alexander S, Heupel W-M, Hirschberg M, Hoffman RM, Friedl P. Infrared multiphoton microscopy: subcellularresolved deep tissue imaging. Curr. Opin. Biotechnol. 20(1), 54–62 (2009). König K. Clinical multiphoton tomography. J. Biophotonics 1(1), 13–23 (2008). König K, Breunig HG, Bückle R et al. Optical skin biopsies by clinical CARS and multiphoton fluorescence/SHG tomography. Laser Phys. Lett. 8(6), 465–468 (2011). König K, Speicher M, Köhler MJ, Scharenberg R, Kaatz M. Clinical application of multiphoton tomography in combination with high-frequency ultrasound for evaluation of skin diseases. J. Biophotonics 3(12), 759–773 (2010). Welzel J, Lankenau E, Birngruber R, Engelhardt R. Optical coherence tomography of the human skin. J. Am. Acad. Dermatol. 37(6), 958–963 (1997). • Demonstrated optical coherence tomography (OCT) imaging in human skin in vivo for the first time. Alex A, Považay B, Hofer B et al. 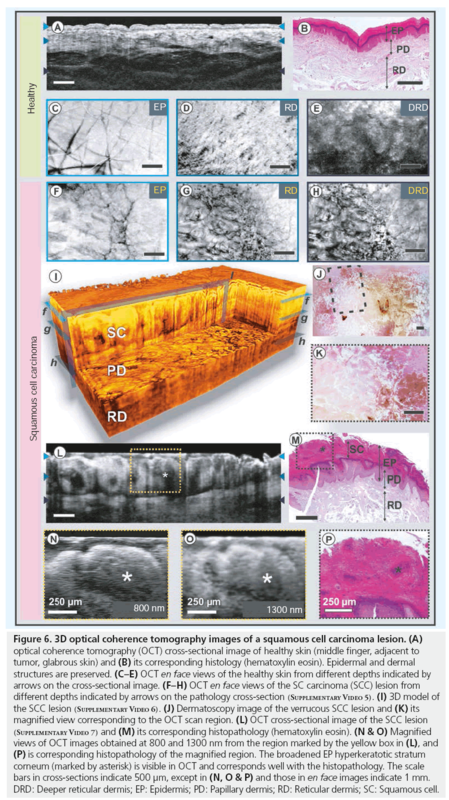 Multispectral in vivo 3D optical coherence tomography of human skin. J. Biomed. Opt. 15(2), 026025–026015 (2010). Gambichler T, Jaedicke V, Terras S. Optical coherence tomography in dermatology: technical and clinical aspects. Arch. Dermatol. Res. 303(7), 457–473 (2011). • A review on technical aspects and various clinical applications of OCT in dermatology. Fujimoto J, Drexler W. Chapter 1: Introduction to optical coherence tomography. In: Optical Coherence Tomography: Technology and Applications. Drexler W, Fujimoto JG (Eds). Springer, Berlin, Germany, 1–45 (2008). • Explains basic features of OCT imaging technique. Choma M, Sarunic M, Yang C, Izatt J. Sensitivity advantage of swept source and Fourier domain optical coherence tomography. Opt. Express 11(18), 2183–2189 (2003). Izatt JA, Choma MA. Chapter 2: Theory of Optical coherence tomography. In: Optical Coherence Tomography: Technology and Applications. Drexler W, Fujimoto JG (Eds). Springer, Berlin, Germany, 48–72 (2008). Fercher AF, Hitzenberger CK, Kamp G, El-Zaiat SY. Measurement of Intraocular distances by backscattering speckle interferometry. Opt. Comm. 117, 43–48 (1995). Leitgeb R, Hitzenberger C, Fercher A. Performance of fourier domain vs. time domain optical coherence tomography. Opt. Express 11(8), 889–894 (2003). De Boer JF, Cense B, Park BH, Pierce MC, Tearney GJ, Bouma BE. Improved Signal-tonoise ratio in spectral-domain compared with time-domain optical coherence tomography. Opt. Lett. 28(21), 2067–2069 (2003). Häusler G, Herrmann JM, Kummer R, Lindner MW. Observation of light propagation in volume scatterers with 1011-fold slow motion. Opt. Lett. 21(14), 1087–1089 (1996). Fujimoto JG, Silvestri SD, Ippen EP, Puliafito CA, Margolis R, Oseroff A. Femtosecond optical ranging in biological systems. Opt. Lett. 11(3), 150–152 (1986). Fercher AF, Mengdoht K, Werner W. Eye length measurements by interferometry with partially coherent light. Opt. Lett. 13(3), 186–188 (1988). Huang D, Swanson EA, Lin CP et al. Optical coherence tomography. Sci. 254(5035), 1178–1181 (1991). • First demonstration of OCT imaging of the human retina in vivo. Fercher AF, Hitzenberger CK, Drexler W, Kamp G, Sattmann H. In vivo Optical Coherence Tomography. American J. Ophthalmology 116(1), 113–115 (1993). Swanson EA, Izatt JA, Hee MR et al. In vivo retinal imaging by optical coherence tomography. Opt. Lett. 18(21), 1864–1866 (1993). Rollins AM, Kulkarni MD, Yazdanfar S, Ung-Arunyawee R, Izatt JA. In vivo video rate optical coherence tomography. Opt. Express 3(6), 219–228 (1998). Drexler W, Morgner U, Kärtner FX et al. In vivo ultrahigh-resolution optical coherence tomography. Opt. Lett. 24(17), 1221–1223 (1999). Podoleanu AG, Rogers JA, Jackson DA. Three dimensional OCT images from retina and skin. Opt. Express 7(9), 292–297 (2000). Unterhuber A, Považay B, Hermann B et al. Compact, low-cost Ti:Al2o3 laser for in vivo ultrahigh-resolution optical coherence tomography. Opt. Lett. 28(11), 905–907 (2003). Wojtkowski M, Srinivasan VJ, Ko TH, Fujimoto JG, Kowalczyk A, Duker JS. Ultrahigh-resolution, high-speed, Fourier domain optical coherence tomography and methods for dispersion compensation. Opt. Express 12(11), 2404–2422 (2004). 42 Huber R, Wojtkowski M, Fujimoto JG. Fourier domain mode locking (FDML): a new laser operating regime and applications for optical coherence tomography. Opt. Express 14(8), 3225–3237 (2006). Potsaid B, Gorczynska I, Srinivasan VJ et al. Ultrahigh speed Spectral/Fourierdomain OCT ophthalmic imaging at 70,000 to 312,500 axial scans per second. Opt. Express 16(19), 15149–15169 (2008). Welzel J, Bruhns M, Wolff HH. Optical coherence tomography in contact dermatitis and psoriasis. Arch. Dermatol. Res. 295(2), 50–55 (2003). Gambichler T, Orlikov A, Vasa R et al. In vivo optical coherence tomography of basal cell carcinoma. J. Dermatol. Sci. 45(3), 167–173 (2007). Mogensen M, Nürnberg BM, Forman JL, Thomsen JB, Thrane L, Jemec GBE. In vivo thickness measurement of basal cell carcinoma and actinic keratosis with optical coherence tomography and 20-MHz ultrasound. Br. J. Dermatol. 160(5), 1026–1033 (2009). • Clinical trial comparing the accuracy of OCT and high frequency ultrasound in the evaluation of nonmelanoma skin cancer lesions. OCT appeared to be more precise and less biased than high frequency ultrasound in tumor lesions with a thickness of less than 2 mm. Olmedo JM, Karen E W, Joseph M S, David L S. Correlation of thickness of basal cell carcinoma by optical coherence tomography in vivo and routine histologic findings: a pilot study. Dermatol. Surg. 33(4), 421–426 (2007). • OCT was compared with routine histopathologic techniques for estimating the superficial thickness of basal cell carcinomas. All sites examined demonstrated excellent correlation of tissue thickness to a depth of 1 mm. De Giorgi V, Stante M, Massi D, Mavilia L, Cappugi P, Carli P. Possible histopathologic correlates of dermoscopic features in pigmented melanocytic lesions identified by means of optical coherence tomography. Experim. Dermatol. 14(1), 56–59 (2005). • Correlation of dermoscopic structures in melanocytic pigmented lesions using OCT and histopathology. The resolution of OCT is not high enough to reveal morphology of single cells. However, it is possible to evaluate the architecture of a lesion. Gambichler T, Regeniter P, Bechara FG et al. Characterization of benign and malignant melanocytic skin lesions using optical coherence tomography in vivo. J. Am. Acad. Dermatol. 57(4), 629–637 (2007). Pagnoni A, Knuettel A, Welker P et al. Optical coherence tomography in dermatology. Skin Res. Technol. 5(2), 83–87 (1999). Korde VR, Garret TB, Wei X et al. Using optical coherence tomography to evaluate skin sun damage and precancer. Lasers Surg. Med. 39(9), 687–695 (2007). Wang Z, Pan H, Yuan Z, Liu J, Chen W, Pan Y. Assessment of dermal wound repair after collagen implantation with optical coherence tomography. Tissue Engin. C Methods 14(1), 35–45 (2008). Coulman SA, Birchall JC, Alex A et al. In vivo, In situ Imaging of microneedle insertion into the skin of human volunteers using optical coherence tomography. Pharm. Res. 28(1), 66–81 (2010). Holmes J. Theory and applications of multi-beam OCT. In: Proceedings of the SPIE. Canterbury, UK (2008). • A multibeam approach to overcome the lateral resolution degradation over the entire imaging depth. This technique is being used in the commercially available VivoSight OCT scanners from Michelson Diagnostics Ltd.
Cunha D, Richardson T, Sheth N, Orchard G, Coleman A, Mallipeddi R. Comparison of ex vivo optical coherence tomography with conventional frozen-section histology for visualizing basal cell carcinoma during Mohs micrographic surgery. Br. J. Dermatol. 165(3), 576–580 (2011). ICNIRP: Guidelines on limits of exposure to broad-band incoherent optical radiation (0.38 to 3μm). Health Physics 73(3), 539–554 (1997). Young B, Heath JW. Skin. In: Wheater’s Functional Histology: A Text and Colour Atlas. Home T (Eds). Churchill Livingstone, London, UK, 157–171 (2000). Gambichler T, Matip R, Moussa G, Altmeyer P, Hoffmann K. In vivo data of epidermal thickness evaluated by optical coherence tomography: effects of age, gender, skin type, and anatomic site. J. Dermatol. Sci. 44(3), 145–152 (2006). Fitzpatrick TB. Soleil et peau. J. Med. Esthetics 2, 33–34 (1975). Bashkatov AN, Genina EA, Kochubey VI, Tuchin VV. Optical properties of human skin, subcutaneous and mucous tissues in the wavelength range from 400 to 2000 nm. J. Physics D. Appl. Physics 38(15), 2543–2555 (2005). Rudolph R, Zelac DE. Squamous Cell Carcinoma of the Skin. Plast. Reconstr. Surg. E82–E94 (2004). Netscher DT, Spira M. Basal Cell Carcinoma: an overview of tumor biology and treatment. Plast. Reconstr. Surg. 113(5), E74–E94 (2004). Gulleth Y, Goldberg N, Silverman RP, Gastman BR. What is the best surgical margin for a basal cell carcinoma: a meta-analysis of the literature. Plast. Reconstr. Surg. 126(4), 1222–1231 (2010). Wong CS, Strange RC, Lear JT. Basal cell carcinoma. Br. Med. J. 327(7418), 794–798 (2003). Gaggioli C, Sahai E. Melanoma invasion – current knowledge and future directions. Pigment Cell Res. 20(3), 161–172 (2007). Jørgensen TM, Tycho A, Mogensen M, Bjerring P, Jemec GBE. Machine-learning classification of non-melanoma skin cancers from image features obtained by optical coherence tomography. Skin Res. Technol. 14(3), 364–369 (2008). Fujimoto J, Drexler W. Part III: Optical coherence tomography extensions. In: Optical Coherence Tomography: Technology and Applications, Drexler W, Fujimoto JG (Eds). Springer, Berlin, Germany, 621–883 (2008). Sacchet D, Moreau J, Georges P, Dubois A. Simultaneous dual-band ultra-high resolution full-field optical coherence tomography. Opt. Express 16(24), 19434–19446 (2008). Cimalla P, Walther J, Mehner M, Cuevas M, Koch E. Simultaneous dual-band optical coherence tomography in the spectral domain for high resolution in vivo imaging. Opt. Express 17(22), 19486–19500 (2009). De Boer J, Srinivas S, Malekafzali A, Chen Z, Nelson J. Imaging thermally damaged tissue by polarization sensitive optical coherence tomography. Opt. Express 3(6), 212–218 (1998). Pierce MC, Strasswimmer J, Park BH, Cense B, De Boer JF. Advances in optical coherence tomography imaging for dermatology. J. Invest. Dermatol. 123(3), 458–463 (2004). Sakai S, Yamanari M, Miyazawa A et al. In vivo 3D birefringence analysis shows collagen differences between young and old photo-aged human skin. J. Invest. Dermatol. 128(7), 1641–1647 (2008). HumKim KH, Park BH, Tu Y et al. Polarization-sensitive optical frequency domain imaging based on unpolarized light. Opt. Express 19(2), 552–561 (2011). Todorovic M, Jiao S, Ai J, Pereda-Cubián D, Stoica G, Wang LV. In vivo burn imaging using Mueller optical coherence tomography. Opt. Express 16(14), 10279–10284 (2008). Barton J, Welch A, Izatt J. Investigating pulsed dye laser-blood vessel interaction with color Doppler optical coherence tomography. Opt. Express 3(6), 251–256 (1998). Zhao Y, Chen Z, Saxer C, Xiang S, De Boer JF, Nelson JS. Phase-resolved optical coherence tomography and optical Doppler tomography for imaging blood flow in human skin with fast scanning speed and high velocity sensitivity. Opt. Lett. 25(2), 114–116 (2000). Westphal V, Yazdanfar S, Rollins AM, Izatt JA. Real-time, high velocity-resolution color Doppler optical coherence tomography. Opt. Lett. 27(1), 34–36 (2002). Blatter C, Grajciar B, Eigenwillig CM et al. Extended focus high-speed swept source OCT with self-reconstructive illumination. Opt. Express 19(13), 12141–12155 (2011). Enfield J, Jonathan E, Leahy M. In vivo imaging of the microcirculation of the volar forearm using correlation mapping optical coherence tomography (cmOCT). Biomed. Opt. Express 2(5), 1184–1184 (2011). • A functional extension of OCT, cmOCT, used for extracting parameters such as capillary density and vessel diameter, which can become a powerful tool in several clinical applications. An L, Qin J, Wang RK. Ultrahigh sensitive optical microangiography for in vivo imaging of microcirculations within human skin tissue beds. Opt. Express 18(8), 8220–8228 (2010). Xing L, Boppart SA. Biomechanical properties of in vivo human skin from dynamic optical coherence elastography. IEEE Trans. Biomed. Engin. 57(4), 953–959 (2010). Tumlinson AR, Hariri LP, Utzinger U, Barton JK. Miniature Endoscope for simultaneous optical coherence tomography and laserinduced fluorescence measurement. Appl. Opt. 43(1), 113–121 (2004). Jiao S, Xie Z, Zhang HF, Puliafito CA. Simultaneous multimodal imaging with integrated photoacoustic microscopy and optical coherence tomography. Opt. Lett. 34(19), 2961–2963 (2009). Li L, Maslov K, Ku G, Wang LV. 3D combined photoacoustic and optical coherence microscopy for in vivo microcirculation studies. Opt. Express 17(19), 16450–16455 (2009). König K, Speicher M, Bückle R et al. Clinical optical coherence tomography combined with multiphoton tomography of patients with skin diseases. J. Biophotonics 2(6–7), 389–397 (2009). Wang LV. Tutorial on photoacoustic microscopy and computed tomography. IEEE J. Sel. Topics Quant. Electron. 14(1), 171–179 (2008). Wang X, Pang Y, Ku G, Xie X, Stoica G, Wang LV. Noninvasive laser-induced photoacoustic tomography for structural and functional in vivo imaging of the brain. Nature biotechnol, 21(7), 803–806 (2003). Zhang EZ, Povazay B, Laufer J et al. Multimodal photoacoustic and optical coherence tomography scanner using an all optical detection scheme for 3D morphological skin imaging. Biomed. Opt. Express 2(8), 2202–2202 (2011). • A noninvasive, multimodal OCT/ photoacoustic tomography system capable of 3D in vivo skin imaging is described. Some of the potential applications of this multimodal approach include characterization of skin tumors, vascular lesions and other similar dermatologic conditions. Chen Y, Yuan S, Wierwille J et al. Integrated optical coherence tomography (OCT) and fluorescence laminar optical tomography (FLOT). IEEE J. Sel. Topics Quant. Electron. 16(4), 755–766 (2010). Patil CA, Bosschaart N, Keller MD, Van Leeuwen TG, Mahadevan-Jansen A. Combined Raman spectroscopy and optical coherence tomography device for tissue characterization. Opt. Lett. 33(10), 1135–1137 (2008).